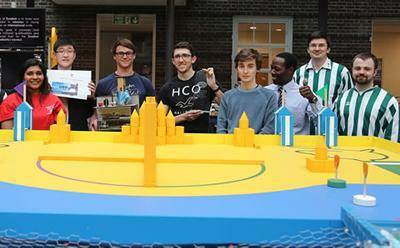 Engineering students from the University of Southampton have won the UK finals of the ‘Eurobot’ competition. This event, which was themed 'Robots on the Beach', took place at Middlesex University's Hendon Campus in London yesterday. The team, called ‘Smack My Beach Up’, consisted of four second-year students - Mitchell Buxton, Hugh Ward, Ben Brooks and Song Zheng. They were tasked with designing, building and programming robots to compete against teams from several UK universities, plus international teams from France and Germany. Each team could build one or two robots to score as many points within the 90 second matches. The winning Southampton robot consistently scored 80-90 points in every match using various devices to push objects, as well as collecting items using permanent magnets mounted on an actuated door assembly. The team were awarded a trophy, as well as a £200 prize from Rapid Electronics who sponsored the event. They will now represent the UK in the international finals of Eurobot, to be held in Paris from 10-12 June 2016, where they will be pitted against the best teams from across the globe.